sorry to be a pain. been keeping an eye on the thread over the past few months but not seen anyone mention it. DOes anyone know if St Peters north of the railway bridge is planning on being done any time soon (Where Revolution is)? I see that St Peters village was done recently and i see postings on roadworks.org for Kingsgate, but nothing in the middle where I am. Want to know If i should be renewing my sky contract or holding on a little longer. @galballyj Welcome to the forums, yes apparently pretty much all of Thanet will be done, possible exceptions might be private roads for example. Actually Westover Gardens is scheduled for the 18 July to 2 August on Roadworks.org - make sure you select 12 months view. Edited to add: The rest of the estate is scheduled for September/October, so Westover Rd may well not be live for some months. As per Ronski's reply, VM are proposed to be in Westover Gardens from 18th July. You can also setup alerts via the Roadworks.org site as dates do change. Well I checked this morning and now Crow Hill shows up on Roadworks.org with a road closure between Stone Road and Claire Court from the 21st July to 10th August. Great timing as this is right at the start of the summer holiday period. What I don't know is whether this means they will be doing the whole of Crow Hill in these 10 days or just the lower bit as both Claire Court and Linden Avenue/Dalmeny Close are all (or very nearly) done now. The permit is for works as described in the description but includes the ~100m section from Claire Court to Stone Road. The permit is showing the highest level of traffic management, which is starting with the closure at the pinch point, and will be altered when the works progress onto the other sections of Crow Hill which won't be under a road closure. Hello all figured i'd give a little update to my situation. Still no closer to getting service at my flat the person i spoke to back in march hasn't been in touch since. Anyone else in the area with East Kent Housing and managed to get Virgin in their flat yet? If you've not already done so, try the Leasehold team who, at a guess, should know what to do to help with answering about getting the building connected. Seeing as the Leasehold page dictates what you can/can't do as a lease holder, they should be able to deal with a request for the building to get wired up as a whole. Well completely p****d off with VM's contractors today. They completely blocked access for Thanet Council bin men today so in this heat our rubbish bin has not been collected and the Council say we could wait up to 5 days for a collection if they even bother. Now I did go out first thing and told one of the contractors they had to allow access but as I rather expected they totally ignored me. Also I explained that where they were placing the connector box outside our property was completely in the wrong place as there is no way of them being able to get a cable under our concrete path it has still been placed there. So if we ever get VM they will need to run a cable the long way round our garden to get to the correct side of the property to provide a connection, no way will I allow them to decide where to run the connection - it will go where I want or it wont happen. Stuart! 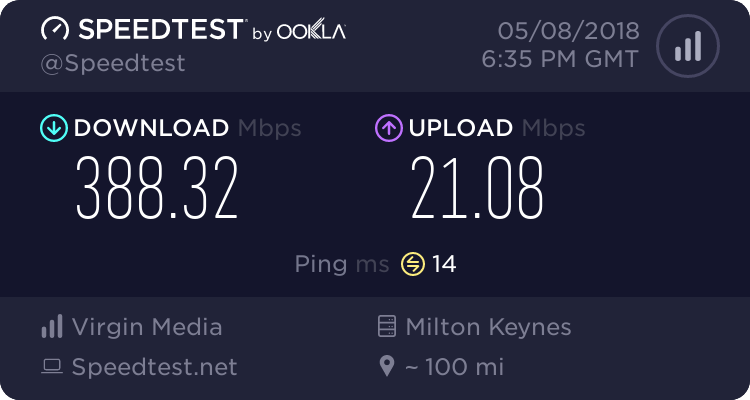 It wasn't VM, but ( sorry if I've told this before), our BT cable broke just as we had a new drive, and repair would have spoilt it. With BT we got them to divert the cable, provided we dug the shallow trench. Could you see,if something like that is acceptable, and, of course find a churl relative to do the deed? Sorry to hear you've had issues Stuart, the contractors that did ours was quite happy to move it's position, even happier when I slipped them a tenner for their trouble. Depending on if your house is detached or a semi they might not have been able to move it, they seem to put one Toby in the middle of semi's, detached properties seem to get their own Toby. If you want I could pop round at some point and see if there is a way around it. No worries. As far as I'm concerned its their problem. No skin off my nose, if it causes them extra work tough. Its detached by the way. That's probably exactly the attitude that the installer will take, they get paid peanuts so they want to get it done as quickly as possible, I bet most don't care what it looks like either. I left a nice note in my Toby explaining where I wanted it routed and I'd dug a trench the other side of the hedge, I was lucky the guy phoned me and waited for me to drive up from Sandwich. The issue they will have if we go with VM is that there is no way a continuous trench can be dug from our front garden wall to our house, unless you use a pneumatic drill which would wreck the crazy paving and the 6 inch thick concrete path surrounding the house. The other issue is that our ground level in the garden is roughly 4 feet above the street level where their connector box is. The only route that can be run easily once the come up our side of the front garden wall is above ground round the garden walls and up over a gate frame and on to the house wall, then along the wall some 12 feet to where they would have to place any external box prior to drilling through to indoors. However I have a major obstacle in getting VM and that is my wife. She is so furious at the mess and disruption, which she cannot possibly see any good reason for, that she flatly refuses to contemplate allowing VM in the house. They don't really need a trench, just a slit, or rake out a morter joint in the paving. The tube they install is either 6 or 8mm diameter, I'm sure it's a 6mm tube.